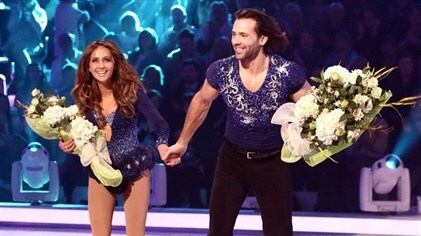 Samia Ghadie and her partner Sylvain Longchambon were the eighth skating couple to leave Dancing On Ice in week 8 after a skate-off with Luke Campbell and Jenna Smith . In the “Save Me” skate Luke Campbell skated first to Don’t You Worry Child by Swedish House Mafia. It was a solid performance but Luke is not a natural skater and looks a little hunched on the ice. Next up was Samia who had pulled her groin earlier during her first routine so the odds were stacked against her. There was another bit of solo skating from Samia during the routine and she does make some lovely lines when skating with Sylvain. Karen Barber, Ashley Roberts, Jason Gardiner and Robin Cousins all voted to save Luke so it was goodbye to Samia Ghadie and Sylvain Longchambon. It was the right decision but I will miss Samia. Jason and the rest of the judges felt that Luke was starting to deliver “a performance” and that was why they saved him. So it looks like Matt, Gareth and Beth will probably make the final but Luke is not without his chances. Can’t wait until next week.